If you’re searching for a new bookcase for your home or office in Alpharetta, Woodstock, Sandy Springs, or any other community in or around the Atlanta, GA, area, look no further than the options we offer at NorthPoint Office Furniture. 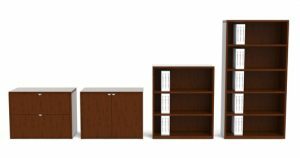 We have a wide array of bookcases and other storage options that will help you organize your office. At our beautiful showroom, conveniently located in Roswell, you’ll be able to see the bookshelves we offer and select a specific bookcase that best fits the dimensions and aesthetics of your office. We have furniture from some of the most trusted names in the industry, like Cherryman, DMI, Global, and HON, so you can rest assured you’re receiving a high-quality, durable piece of furniture. When you purchase a bookcase at NorthPoint Office Furniture, you’ll benefit from our unparalleled customer service. We’ll assemble all of the furniture you purchase from us at no additional charge, and we will even deliver your furniture so that you can get back to work or enjoy your free time. For more information about the bookcase and file cabinet options we provide for offices in Alpharetta, Woodstock, Sandy Springs, and all other Atlanta, GA, areas, contact NorthPoint Office Furniture today.